This time of year in Connecticut, photographers do tons and tons of family photography sessions. And every family tends to want the same thing. . . colorful Fall leaves, everyone smiling at the camera and to look amazing for their yearly Christmas card. This family wanted a little of that, but they also wanted to make sure that they captured the age and personality of their young boys and the love that they all have for each other. So we set off to create some memories together while capturing their Fall Family Photos at the Connecticut River. Dad’s all love to rough-house with their kids. And this Dad was no exception. I merely suggested that the boys try to take down their father. They jumped at the chance! But, for now and probably a few more years to come, Dad still has the upper hand and quickly showed his boys who was in charge. Mom’s are lucky. We get to experience the softer side of our kids and not only joke and laugh with them but also snuggle and coddle them a bit. Both of her boys told us that one of the things they appreciated most about their mom was her cuddles. This young man is so kind and good-natured. He happily kept up with their dog and even wanted a photograph of just the two of them together. He is very interested in building and designing things but can’t decide if his love for animals or creating will win out when he is ready to start preparing for his future. Just a detail shot of the oldest’s hands, but these hands have created so many lego structures and other amazing things. Kind of nice to be able to remember what they look like now, before he grows into an adult. Their little brother is kind of quiet and sweet, but his interests varied wildly from his older sibling. He is very into sports, and from all of the football and rock throwing that he did during and at the end of our session, I’d say he’s pretty good. Mom and her youngest just sharing a private laugh together. She’s still the lady in his life right now. Dad and Mom got a quick shot right as the sun was leaving the sky for the night. Things had gone so well, and I think they were relieved and fully relaxing into each other. Such a happy family and so full of love and laughter. 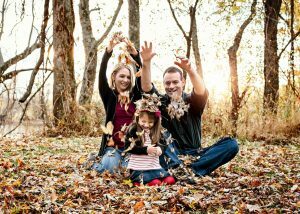 As our Fall has come to a close, my family photography sessions are over for this year. If you would like to create some fun memories with your family in the Spring surrounded by flowers, contact me today. I’m already booking for May and beyond.